At around 11 p.m. on Sept. 4 in a packed San Luis Obispo City Hall, veteran City Councilwoman (and current Vice Mayor) Carlyn Christianson made a pronouncement: In her 18 years as a decision maker at the city and county, she'd never grappled with a project quite as vexing and divisive as the Anholm Bikeway. CYCLETRACK APPROVED The SLO City Council voted 3-2 to approve a protected bikeway through the Anholm neighborhood on Sept 4, which will result in the elimination of 56 on-street parking spots. "I will say that this is probably the most contentious, difficult issue that I've ever dealt with, and I did decide on the Los Osos sewer project," Christianson said during council deliberations, to some laughs. Following about two hours of public comment, with the clock approaching midnight, the SLO City Council put a capstone on the more than 2-year-old community debate, voting 3-2 to approve arguably the most controversial version of a bikeway to connect downtown SLO with Foothill Boulevard. The council approved a fully protected cycletrack to traverse Chorro and Broad streets, that will require the elimination of 56 on-street parking spots throughout the neighborhood—a tradeoff that many affected property owners vehemently oppose. "I think we need to be bold, and we need to move forward in a way that's actually going to get more people on bikes," Mayor Heidi Harmon said before casting her "yes" vote. With its decision, the City Council bucked a recent Planning Commission recommendation to merely install traffic-calming infrastructure in the area for a trial period—which is what Christianson and Councilmember Andy Pease were interested in. "I just feel like this neighborhood does need a little more time to adjust to the changes that are coming," Christianson said, referring to changes like new housing developments nearby. "Right now I just feel like we have that time. We need that time." 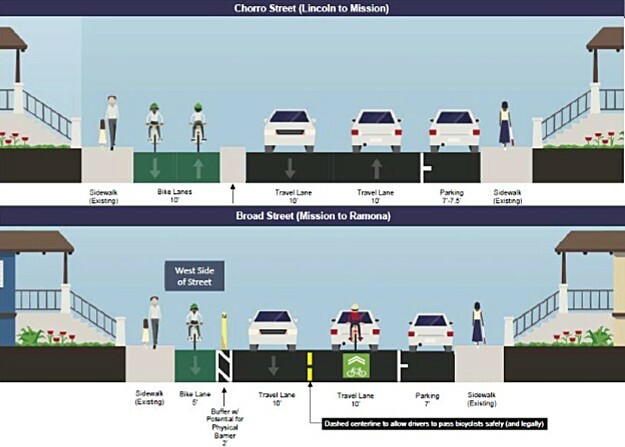 The approved cycletrack will extend from Lincoln to Mission streets on the west side of Chorro, and then move over to the west side of Broad Street, where it will run from Mission to Ramona streets. That version of the plan was one of several the council considered. Others included unprotected bike lanes, traffic calming only, and a traffic diverter to send vehicles off Broad onto Chorro. Public opinion on the project ran the gamut. Within the Anholm neighborhood itself, two formal groups formed to lobby the council: the Anholm Neighbors United (opposed) and SLO Streets For All (in favor). Dozens of other city residents also gave their two cents. Even a few children spoke, asking the City Council to approve a protected bike path. "I think we should put a separated bike path on Broad Street so my friends and I can ride to school safely," said Wesley, a 10-year-old Anholm resident. Ultimately, it was the council majority of Mayor Harmon and Councilmembers Dan Rivoire and Aaron Gomez who had the last word. Gomez emphasized the importance of a "cultural shift" away from cars to counter climate change. He named cities like Bend, Oregon, and Boulder, Colorado, as successful examples. "This cultural shift can happen, but they [require] the time and effort and political will to do it," Gomez said. Rivoire said he cemented his decision while biking around the city over Labor Day weekend with his young daughter. "I felt very fearful riding around with my daughter on South Higuera [Street]," Rivoire said. "I felt that the only way that we would really sort of make progress on changing that, so I'd feel comfortable having her do it on her own or just get in the habit of doing it more often, would be to carve out protected space." Anholm resident, opponent to the bikeway, and 2018 mayoral candidate T. Keith Gurnee expressed disgust with the City Council's decision to New Times on Sept. 5. "They totally ignored our neighborhood," Gurnee said. "It's just sad to see the precedent they're setting. ... I've never seen anything like this council that's taking us down a road that's antithetical to what SLO is. Heidi Harmon cast the deciding vote, and I think it's going to hurt her.